Stop Taping flyers to my front door ! I came home the other day to find a brightly colored yellow flyer taped to my front door. When you see such a thing the first thought that pops into your head is that perhaps it’s some kind of public service announcement “Gas leak, do not enter” or “Will be turning off the water at such and such a time – be advised …” But on this occasion is was none of the above – it turned out to be a shameless promotion for “Hazardous Tree Removals and Stump Grinding”! 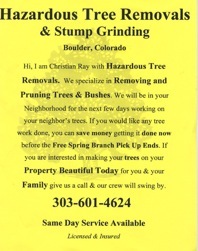 A nice man, Mr Christian Ray, informed me that he was in the area removing “Hazardous Trees” whatever the hell they are, and for a fee would grind the stump of those “Dangerous Trees” too. While I can vouch for the dangerousness of trees, they are heavy wooden objects that protrude upwards out of the earth, I despise this type of gorilla marketing! Next in the hall of shame we have a Mr Brian Sherwin of Boulder Creative Housing. Now Mr Sherwin also took a liking to my front door and took it upon himself to attach a nice flyer of a lovely couple who are looking for a house in my neighborhood. Now I’ve got nothing against the couple, they look nice (baby too) but Mr Sherwin please don’t tape shite to my front door! 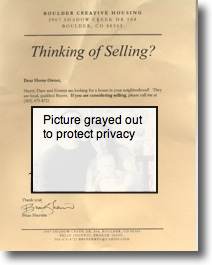 If the couple were camped out in front of my house, wielding signs of protest demanding me to sell the house then perhaps it would be Ok but I get the sneaking suspicion that you attached this notice to every house in my neighborhood Mr Sherwin and perhaps even every front door in the whole of Boulder county if not the entire United States! Who is permitted to tape shite to my front door? On further research it seems that it’s illegal to put a flyer in a persons mail box so perhaps this is some type of loophole in the law these people have found. If Tree Cutters and Real Estate Agents can tape flyers to our front doors what next? Will I come home one day and see an ad for that purple pill or hemorrhoid cream? Feel free to send me more entries for the wall of shame. I will try to contact the companies I have featured and get their side of the story as well as leave the comments open below just take make it a level playing field. I like to start off by saying that I don’t yet own an iPhone but I’d like to post my impressions of it here from the 30 minutes of intimate time we spent together at my local Apple Store here in Boulder on Friday 29th of June 2007. 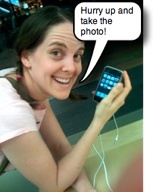 The photos to the left were take with an iPhone at the Apple Store (modified with ImageWell). The first thing you notice is how bloody thin she is, much thinner than my chunky 4G ipod. She fit nicely in my paw, just the right size and then there’s that screen, the screen is truly amazing. Sure it’s small compared to the big laptop screen that most of us are use to staring at all day long but it’s really bright and it has twice the resolution of any laptop screen. This means than type appears to be crisp especially when it’s small with no jaggy edges. Movies and Youtube video are just gorgeous to look at. I pulled up a Top Gear Clip from YouTube, one that I had see in high resolution on my home computer system and it played back flawlessly and looked as good as the high res version I had seen at home. Apple has set up a table of about 10 or so iPhones at the store and I overheard one sales rep say how amazed he was that they’re weren’t more questions, a real testament to it’s easy of use. It really is amazing how easy it is to use. One of the biggest questions we’d all has was how easy it was to type on the virtual keyboard, the iPhone does not have a regular keyboard one appears on the lower part of the screen. It does take a little getting use to but over time I think the it will be a non issue. I did find myself mistyping quite a bit at first but gradually got the hang of it towards the end. Browsing the web appeared to work quite nicely with the NYtimes.com website coming up quite quickly. The zoom function works well, just place fore finger and thumb on area to be zoomed and expand fingers outwards. The opposite gesture can be use to zoom back out. Dragging a finger downwards makes the web page scroll downwards. It should be noted that the connection to the internet was made using the iPhone’s WIFI capability not EDGE so I can’t comment on how EDGE works. If you don’t get the whole Mac thing you’re probably not gonna rush out and buy an iPhone but then again you probably think a car is just a means to get from A to B and drive a Toyota Camry (ok the 07 V6 Camry is not too shabby and when my A8 dies I’ll probably get a Subie) I was talking to a mate of mine the night of the launch, he is actually a mac guy but not as addicted as some of us. He’d just spent $400 on a Treo for work and when I told him about the iPhone he seemed a little upset. Sure carriers offer phones for free but they are normally crap so you’ll end up spending $300 to $400 on a decent one so the $499 is not our of the realm of possibility if you want summin nice. I think the iPhone is as good as all the hype has made it out to be and even if you’re not going to get one right away you should definitely rush down to the nearest Apple Store and spend some quality time with her.